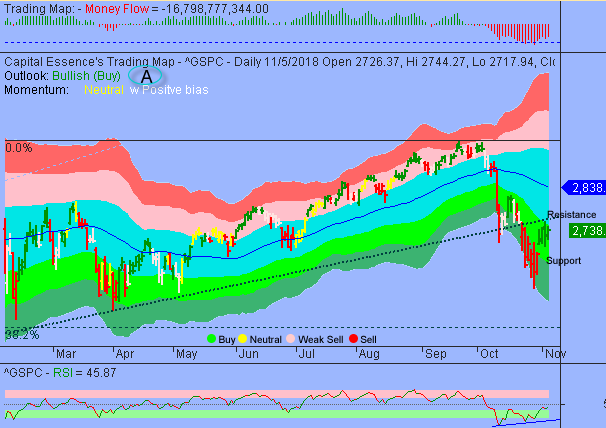 Good Morning, this is Capital Essence’s Market Outlook (the technical analysis of financial markets) for Tuesday November 6, 2018. Stocks closed mix Monday as traders remained cautious ahead the U.S. congressional midterms elections on Tuesday. For the day, the S&P gained 0.6 percent to 2,738.45. The Dow Jones Industrial Average added 0. 76 percent to 25,461.70. The tech-heavy Nasdaq Composite fell 0.38 percent to 7,329.05. The CBOE Volatility Index (VIX), widely considered the best gauge of fear in the market, rose more than 2 percent to 19.96. U.S. energy and financial sanctions on Iran were officially reimposed though U.S. issued temporary waivers to eight countries on Monday. The waivers are meant to provide the countries time to seek alternatives to Iranian oil and help prevent oil prices from de-stabilizing. The Energy Select Sector SPDR ETF (XLE) jumped 1.67 percent on the day but is down nearly 5 percent YTD, underperformed the S&P by a wide margin. Now the question is whether last week’s rally is a beginning of a new trend or it’s merely a dead cat bounce? Below is an update look at a trade in XLE. Our “U.S. Market Trading Map” painted XLE bars in red (sell) – see area ‘A’ in the chart. The first dominant feature on the chart is the falling trend line starting in early 2014. The second dominant feature of the chart is the sideways trend between 78 and 62 since September 2017. 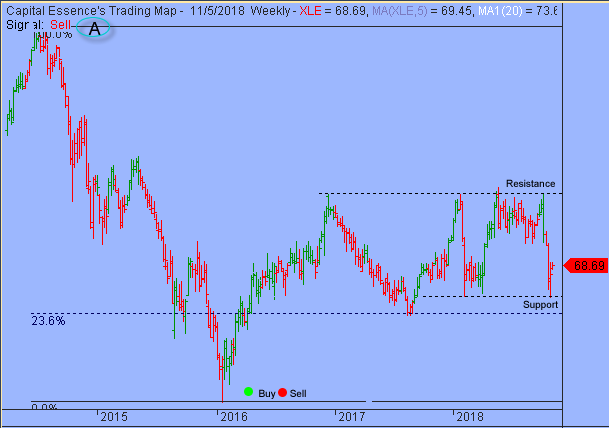 Over the past few weeks, XLE has been trending higher in a short-term corrective bounce after the October selloff found support near the early 2018 lows, just above the lower boundary of its 2017 trading range. This is a short-term positive development and opened up for a retest of the upper boundary of its short-term trading range, just above 78. S&P continues basing sideway near resistance at the 2016 rising trend line. This level was significant when the S&P fell below it in October. Momentum has been strengthened but does not appear strong enough to generate widespread breakouts. Additionally, Money Flow measure still hovers near multi-year low, indicating a negative net demand for stocks. These elements will continue negatively affect trading sentiment in the coming days. Right now the most important thing to watch is the rallies and retreats behavior as the 2016 rising trend line, around 2765, is tested as resistance. A close above it is required to neglect the medium-term downward trend pressure. There is a no reason to turn particularly bullish until this area is eclipsed. In summary, trading behavior in the S&P remains constrained by a short-term sideways pattern and shown little evidence of a sustainable change in trend. 2765 is the line in the sand. There is a no reason to turn particularly bullish until this area is eclipsed.